My alarm went off at 5 am. My roommates and I hobbled through the dark house, fumbling around with the toaster. In an uncanny revision of a former life, we piled into the station wagon of my adolescence and tore down Eastside Road. Past River Road, onto Vine Hill, across Guerneville Road, over as far as Highway 116, and further still until Graton Road splits off into a steep dirt path lined with dusty trucks and acres of vineyard. We parked up alongside the vineyard owner’s house, a sleepy light visible through the kitchen window, and stayed in the dark car a moment. It was 48°F outside and the windows were fogged over. Someone’s blurry knuckle rapped on my window: the vineyard owner. We obliged. 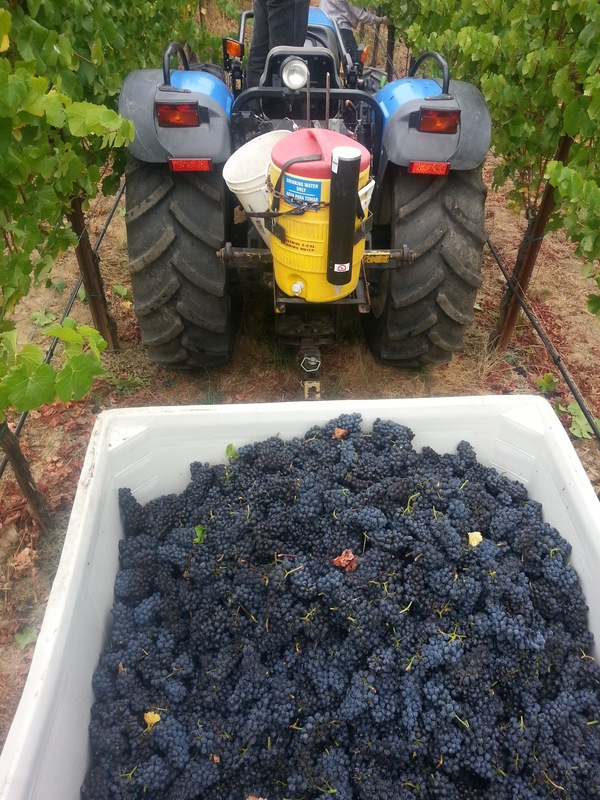 It was a mad scene: a 15-ton pick alongside two other wineries, with 5 tractors picking our fruit alone. With a veritable army it was done in an hour and a half. That is Dutton Ranch for you – a quasi empire of a family business in Sonoma County grape-growing. The rats and I boarded a tractor trailer each and bumped on down the uneven ground, getting showered with dust, dew, and diesel. We were there to see and to learn and to sort leaves out as the pickers piled fruit in. They move fast and get paid by the tub-load, calling out their numbers as they heave the fruit into the bins by a variety of means. I hovered on the trailer, plucking leaves and green clusters out, using my basic Spanish, trying to keep track of the crew’s progress through the block. “Dos mas detras?” “No mas!” “Por favor…” Are you coming back? Which block is next? And there are politics. We have to stay out of everyone’s way – the crew foremen, the pickers, the vineyard managers bustling around with walkie-talkies and clipboards. We pull leaves, but if you’re too thorough the pickers stop avoiding leaves. My urge to help them dump their fruit is strong. But that’s their job – don’t mess with it. 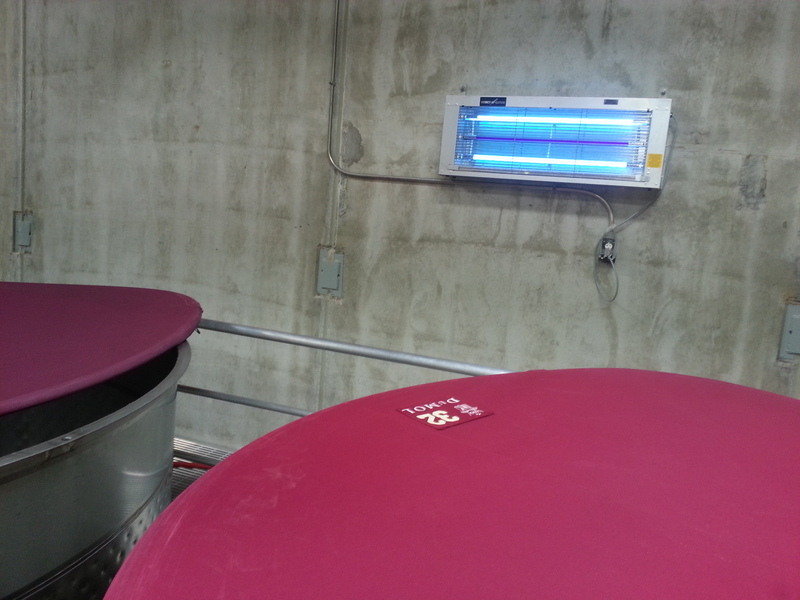 Back at the winery, we set up and sanitized our equipment and took up our posts along the sorting table. We turned up the music, we chatted, we threw green clusters at each other. We listened to the heartbeat of the crush line: the shaking hopper’s metal throbbing, the sorting table’s buzzing conveyor dropping clusters into the chugging destemmer, from which the berries patter into metal bins and stems fly out with the whipping of a weed-whacker. Then we licked the place clean. We’re juggling other things too, now – the number of ferments is growing every day. More on that next time. there they are again. note the equally amazing bug zappers. brilliant! I have yet to see a fruit fly. Our fruit looks and tastes great. The weather and fruit quality couldn’t be more different from the last (and only) twelve months of winemaking I’ve experienced. Even after months of glowing weather and steady, healthy ripening, cautious optimism prevails despite the urge to celebrate. 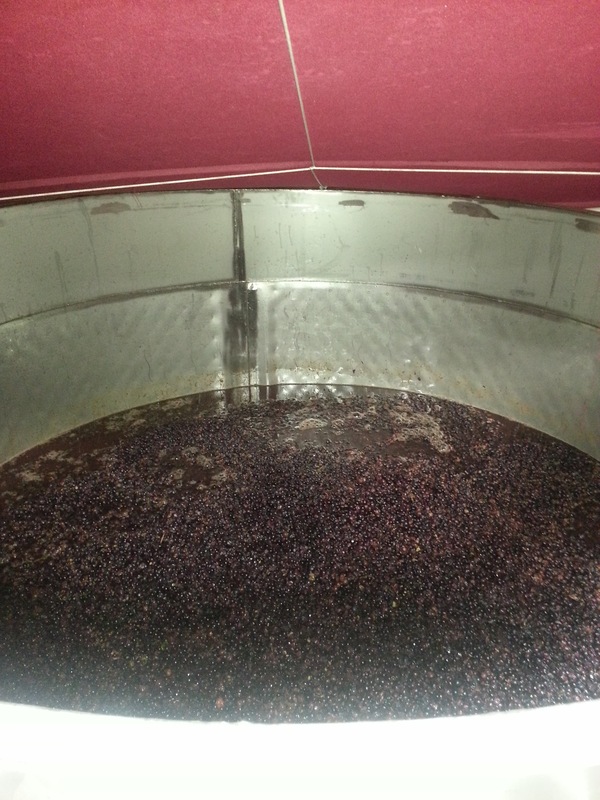 A bumper crop is a beautiful thing after two vintages of low and complicated yields. But an abundant vine does not a great wine make. Vigor has to be carefully managed. Are the berries too big? The clusters? We’re talking Viognier bunches the size of your head and overladen vines that crews have thinned out two and three times. I’m hearing things like picks estimated at 70 tons coming in at 130. What do you even do with all that fruit? There are numerous takes going on why this has happened and what may come of it. I’ll be returning to this subject because so far it is a defining characteristic of the vintage and the harvest. Things have been quiet here at crushed & stirred because there wasn’t much on at the winery until suddenly it was game time. And now it’s now. We’ve been pulling Pinot and Chardonnay in for a solid week but myriad picks remain – not all of them as chaotic as the one described above. Just yesterday, at a quieter, late morning pick, I kept an eye on the leaf-plucking as the sun broke through the Sonoma fog, talking about Jalisco with the tractor driver. I knew we had a long day ahead of us at the winery. It felt good to be back. Most mornings I wake up a little stiff but I’m still waiting for the other shoe to drop – to start feeling the burn and breaking things. Right now I’m relishing the return of a sense of immediacy and purpose. Of bustling around the winery from mission to mission. I don’t mind the early mornings and the lengthening workdays – that’s what I came here for and that’s what I came back here for: the invasion of the extraordinary into the ordinary. Ohhh the great reveal! Loved the last line.